So. It happened. That thing I’ve been told is a right of passage as a cyclist. The thing every non-cyclist I know has said would happen. There’s been contact between my body and an inanimate, metal shell. Shortly followed by contact between my skin and bitumen. I was knocked over in traffic by a car. It’s certainly been a novel experience. It’s not the first occasion I’ve had a high velocity date with an unyielding surface but it is the first time I’ve had to rally witnesses and start taking notes on my now moderately broken phone. It’s the first time I’ve had any sort of accident in significant daytime traffic, hopefully the last. My experience Saturday before last felt like one of fate. Normally I wouldn’t have ridden that route, bike or time on a Saturday. I’d been working to install a pair of power meters on Friday night and seriously screwed the job on my road bike, leaving me with a TT bike only to ride Saturday. That ruled out a bunch ride and I slept in because I’d been up late working on the bike. Late to the cafe, late home, almost early to the grave. The above led me to be at Charles St, North Perth at about 10am on my way to a mechanic to sort an unrelated problem. A driver started to tail gate me, sitting on the lane markings. I could sense that they were about to do something stupid so I tried to stare them down over my shoulder. They still opted to pass closely and pull even with me at close quarters. I gestured with my hand in a universal sign for “get your death trap away from me”. My hand was knocked, I steered, fell and slid. On the way down, I caught sight of an “L” plate on a 4wd behind me, and thought “pretty please don’t run me over”. My wish was honoured, the young man driving was on the ball and pulled up with hazard lights on. His mother pursued the driver responsible and brought them back to the scene. The mother happened to be a nurse and inspected my damage, politely implying I shouldn’t be a baby. They would later drop me and the bike home. Honestly, these moments of humanity took a lot of the edge off being bloodied up. With some help, I picked myself and bike up and moved to the roadside. This led to what felt like 20m of staring and swearing at the damage – although my GPS tells me I only spent 12m at the roadside in total before picking up a bunch of KoMs in the back of a car. From here it was a bit of a blur. I gathered names and numbers and had a rather cyclical and annoying conversation with the driver who “didn’t” see the 194cm tall man riding at nearly 50km/h, in broad daylight, on straight, dry road on a white bike with daytime lights. I tried to console the traumatised granddaughter of the driver. All up, this was a “good” crash. I didn’t destroy myself or the bike; quite lucky for a 48km/h impact on a moderately busy road. I slid and lost some skin and acquired some good bruises. I’ve lost access to my bike for a couple of weeks and spent a lot of time cleaning wounds, pursuing insurance and making part selections. Disruption to training was almost like going into withdrawal. Loss of sleep and the repeated pain of cleaning wounds and the occasional bump aren’t great but they’re a lot better than the potential alternatives I avoided. I’ve filed a police report on which I’m yet to get any traction. The bike is fixed and the road rash should fade within a couple of weeks. I’ll have to go back to work on poking people about road safety. 2 Comments on "Knocked over in traffic"
Great write up mate and very handy advice still bewliders me what goes through some drivers heads. Glad your healing up and feeling better. Late response but thanks for the well wishes. At this stage I’m down to two little patches of dressing, very nearly all skin! 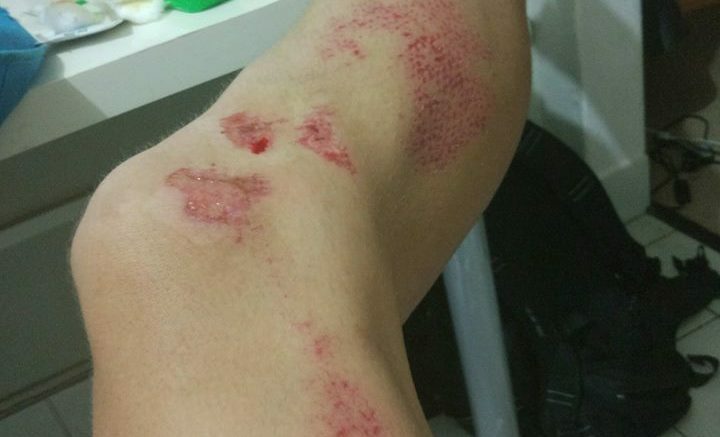 Skin is much preferable to road rash if you ask me.